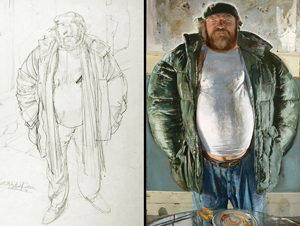 “Drawn to Paint: The Art of Jerome Witkin” consists of 70 works including drawings, paintings and sketchbooks. Dividing the show between two venues, allowing for broader access and engagement within the community, “Drawn to Paint” will be on view Sept. 8-Oct. 23 at the SUArt Galleries on the Syracuse University main campus and the XL Projects gallery in downtown Syracuse. This exhibition, with Edward A. Aiken as its curator, is the first time Jerome Witkin has allowed his drawings to be displayed beside their finished works. “Drawn to Paint” will be traveling to other museums around the country during a two-year tour that will conclude at the Palmer Museum of Art in University Park, Pa. The SUArt Galleries will host a free opening night reception from 5-7 p.m. on Thursday, Sept. 8. Guests of honor will include the artist and curator of the exhibition. Patrons are welcome to view the exhibition until the gallery closes at 8 p.m. The reception is open to the public. The works of Jerome Witkin carry forward into our era the grand Western European tradition of history painting. His images offer dramatic narratives that reveal themselves over time. Many of his most interesting paintings are large multiple panels, each section presenting a different chapter of an unfolding story. Their scale pushes the viewer back to see the whole composition, while his brushwork encourages close examination to better admire the painting’s surface. While Witkin’s painterly technique appears spontaneous, it is grounded in drawing. He is a highly skilled draftsman who enjoys drawing both for its own sake and as a way to work through the challenges of designing large compositions. Drawing allows Witkin to study various possibilities before committing brush to canvas. “Drawn to Paint” explores, for the first time, this crucial aspect of Witkin’s process. By installing the preparatory drawings, sketches and sketchbooks alongside the finished canvases, such as in the multi panel “Division Street,” which will have two preparatory drawings as well as a sketchbook on display, the exhibition invites the public to see the artist’s method as the compositions evolve to completion. The works included in “Drawn to Paint: The Art of Jerome Witkin” come from galleries, private collections and museums across the country. Notable institutional lenders include the Munson-William-Proctor Arts Institute in Utica, N.Y.; the Memorial Art Gallery in Rochester, N.Y.; the Everson Museum in Syracuse; the Palmer Museum of Art in University Park, Pa., and Jack Rutberg Fine Arts in Los Angeles. Both the exhibition and accompanying catalog will contribute new information to the study of contemporary narrative painting. The comprehensive and fully illustrated catalog will be published by the Syracuse University Art Galleries and features an essay by Aiken, long time colleague of Witkin, as well as articles by Peter Selz, Donald Kuspit and Sherry Chayat, well-known scholars of contemporary art. Aiken presents original information on Witkin’s narrative style, while Selz and Kuspit comment on several of Witkin’s most important works. The catalog will be available for purchase through the gallery store and the SU Bookstore. Witkin’s career as a professor at Syracuse University’s School of Art and Design spans four decades. He has known an enviable number of artists central to the development of 20th-century American painting and he has studied the history of art with great care. Witkin brings all of this knowledge of drawing, painting and history to bear in the classroom studio where he encourages and critiques his students. This exhibition celebrates Witkin’s career as an artist-teacher, a dual role in which he has excelled. The show is free and open to the public. Complete information and related programming is available by visiting the official exhibition website at http://suart.syr.edu/witkin.